A CORK MAN has been airlifted by the Irish Defence Forces Air Corps back to his home city for treatment after he was seriously injured in a bus crash in Cambodia last month. 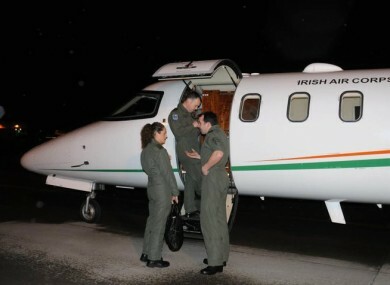 An Air Corps Lear Jet 45 aircraft was used to transport a medical team from Cork University Hospital to London Heathrow this morning to collect the patient and bring him back to his home city where he arrived at 9.40am. The 29-year-old an was among 35 people injured in a bus crash in Cambodia, close to the Vietnamese border last month. A spokesperson for Cork University Hospital told TheJournal.ie that the man’s condition is comfortable. It is understood that a technicality in his travel insurance meant his policy did not cover him which is why the Air Corps had to be deployed in this instance. The Department of Foreign Affairs has urged all Irish citizens to check the fine print of their travel insurance before travelling abroad. Email “Cork man airlifted home after Cambodia crash”. Feedback on “Cork man airlifted home after Cambodia crash”.